Hi I am currently using a modified version of spatial hashing algorithm written by Christer Bystrom. This algorithm is OK for collision detection. 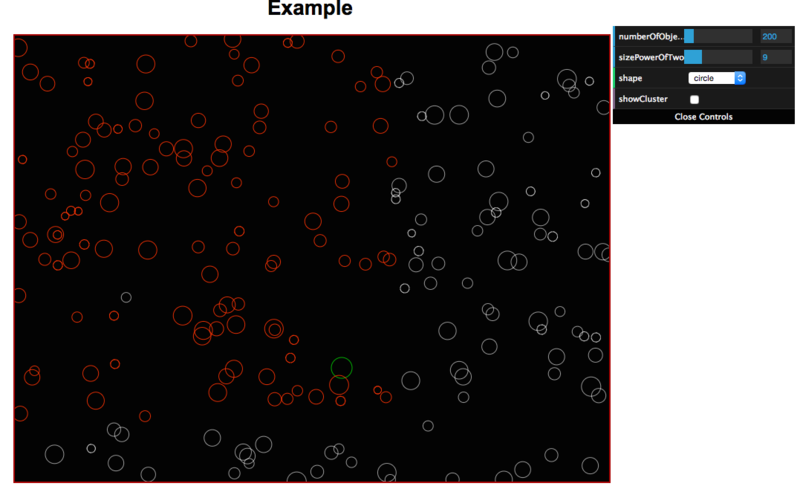 However when I use it for detecting entities in interested range it has its limits. I use a huge map. (10000 x 10000 pixels) When I am moving my player, I expect to see what are around my player on the screen. Sometimes some entities are right in front of me or just behind me but I can't see anything on the screen until I get really close. Here is a visual demo I created for that algorithm. I modified it to work with circle objects. In the demo picture I have already set the powerOfTwo attribute to 9, which is pretty big. The green circle is my mouse position. 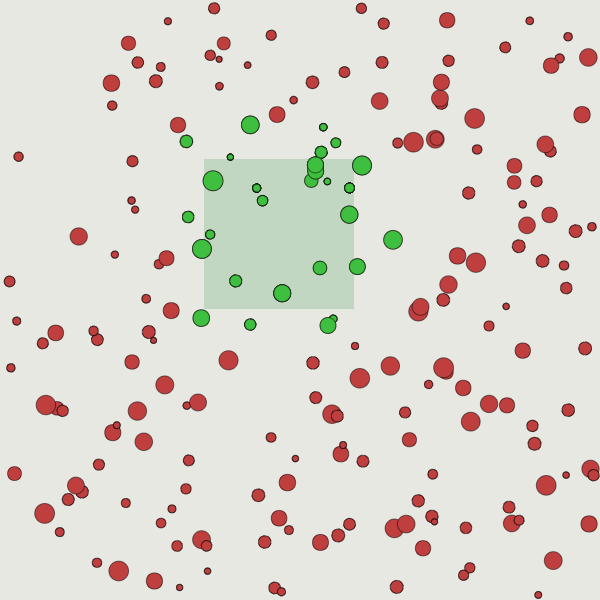 The red circles are those entities within my player's interested area. But this is not a good solution. The player should be able to see things on all directions around itself and stretch out further to about the same size of the rectangle area holding those red circles. So I am looking for a better solution out there to implement in my game. I hope it is accurate and fast for detecting entities within interested area, and better not too hard to understand. It can be any other way (quadtree, dynamic tree, RTree or whatever fits the type of game I am making). I have also read about this, but not sure if those methods work well with interests management. You have to specify the “area of interest” in the retrieve function. The library wants retrieve to take a rectangle, so pass in a rectangle centered on the player. Not the answer you're looking for? Browse other questions tagged spatial-partitioning or ask your own question. How often should I do a spatial partition over a top down MMO 2D game?